Arduino can enable such a fascinating array of fun projects for the budding developer and robotics enthusiast in you. That’s why we’re happy to announce our first bang up deal, a complete Arduino starter kit at a deeply discounted price ($75.99 from $520) in our store. 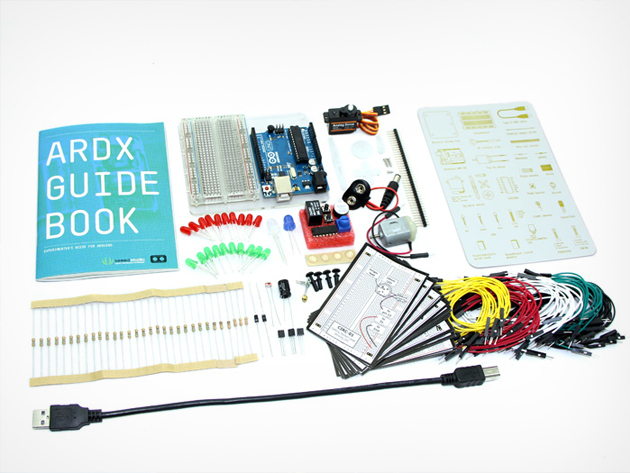 A complete Arduino starter kit with three in-depth courses to help you master our coming robot overlords. Ever want to build your own theramin? What about making a simple machine to sort Skittles from M&M’s? Or perhaps you’ve been wanting to make your very own fire-breathing animatronic pony? Lucky for you it’s not quite as complicated is it might sound. Anyone can have their own robotic pony, including you, if you dare set out on the challenge to build one and animate it with an Arduino. You’re really only limited by your own imagination and willingness to experiment. You’re probably thinking that that’s a lot of money for an Arduino, and you’d be right. That’s not precisely where the value lies though. Instead it’s in the three courses that are usually kind of expensive and actually really well laid out. Sometimes learning straight from the manual isn’t for everyone, and you might need some inspiration to get going. So that’s where the real value lies, in helping you get started on a magical pony filled journey.